Gum, Red - Goosebay Sawmill and Lumber, Inc.
Red gum is from the Sweet Gum tree. Lumber is usually sorted between the light colored sapwood, sold as sap gum, and the reddish brown heartwood sold as red gum. Sweetgum occurs naturally in the southeastern United States. Its range extends from New Jersey, Pennsylvania, Maryland, Virginia, West Virginia, Ohio, Indiana, and Illinois, south to Missouri, Arkansas, Oklahoma and Texas, and east to the Atlantic coast. Red gum has an interlocked grain which makes the drying process long and difficult. 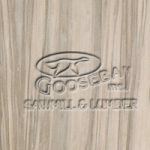 However, when the wood is quartersawn, this interlocked grain produces ribbon striping that is highly desired for furniture and interior woodwork. The wood is moderately heavy and somewhat hard with a relative hardness of 850.